ROCKFORD IL – Emmanuel Lutheran Church, 920 Third Avenue will host Rockford’s second community sing on Saturday, January 6 at 7:30 pm. The event will support Emmanuel Lutheran’s Center for Arts & Spirituality. Suggested donation is $10. There will also be a free harmony singing workshop at 2:00 pm. Rockford area musician and performer Ron Holm will be joined by the Old Town School of Folk Music’s Mark Dvorak in a program of familiar folk songs, sing along favorites and a few other surprises too. Holm performs more than 100 concerts plus over 50 church services each year. He has collaborated on stage with legendary stars like Roy Orbison, Vassar Clements and others. “Community singing is popping up all over the place,” said Dvorak, who is artist-in-residence at the Old Town School of Folk Music in Chicago. “East Lansing, Michigan, Milwaukee, Plymouth, Indiana, Mt. Morris, Wisconsin, of course Chicago, and now Rockford. We had a wonderful turnout last year, and our voices filled the beautiful sanctuary at Emmanuel. We’re really excited to be bringing people together again,” he said. Other surprise guests will be part of the program, which will take place in the acoustically-superb sanctuary at Emmanuel Lutheran Church. Holm and Dvorak will offer a free harmony singing workshop at 2:00 pm the afternoon of the concert. The first fifteen who attend the workshop and make an advance donation will be invited to join the cast on stage for the second half of the concert. The workshop will cover harmony singing basics, other vocal topics and serve as a loose rehearsal. This entry was posted in live performances, Mark Dvorak, music on December 21, 2017 by admin. OAK PARK IL – Sixty years ago this autumn Chicago’s venerable Old Town School of Folk Music was born in a living room in Oak Park, Illinois. On September 30 five teaching artists from the School will celebrate the milestone anniversary by launching The Oak Park School of Folk Music as part of a full day of musical activities. “Folktober Fest” will consist of morning classes, afternoon classes, a “Second Half,” the signature activity at the Old Town School of Folk Music, and an evening home concert in River Forest. The event is sponsored by Music and Potlucks, a community organization dedicated to presenting cultural arts programs to support the Oak Park-River Forest Community Foundation, Housing Forward and the Oak Park-River Forest Food Pantry. Music and Potlucks presented the highly successful fundraising concert “Songs For Peace and Justice” in April. Jason McInnes, an Old Town School Distinguished Teaching Artist, Peggy Browning, Maura Lally and Mark Mitchell members of the all acoustic Americana trio, The Pickin’ Bubs, and Chicago’s “official troubadour” Mark Dvorak will comprise the teaching faculty for the morning and afternoon classes, and provide the entertainment for the evening home concert. The classes will take place at the First United Church of Oak Park, 848 Lake Street. Morning classes include Youth Guitar (ages 7+), Guitar Basics, 5-String Banjo Basics, Fiddle Repertoire, and Finger Picking Guitar Basics. Afternoon classes include Improvise and Solo, Celebrating Tradition, Irish Fiddle and Singing Together: Melody and Harmony. Admission to the evening home concert is $20 suggested and by invitation. For more information email musicandpotlucks@gmail.com. Information can also be found at www.markdvorak.com and www.facebook.com/musicandpotlucks. This entry was posted in live performances, Mark Dvorak, music on September 20, 2017 by admin. ROCKFORD IL – In the turbulent 1960’s folk songs were sung on campuses and heard on the radio. Artists like Bob Dylan, Joan Baez, Phil Ochs and Pete Seeger recorded and performed to packed houses across the country. For modern day troubadour Mark Dvorak the times haven’t really changed. “People are looking for each other,” said the singer who performs in Rockford at Spring Creek UCC on Saturday, August 12 at 7:00 pm. Dvorak has performed in thirty-eight states and in parts of Europe and Canada. He has won awards for journalism and children’s music. In 2008 he received the Woodstock Folk Festival, Lifetime Achievement Award and the Lantern Bearer Award from Folk Alliance International in 2013. Last November he celebrated his 30th anniversary on faculty at Chicago’s venerable Old Town School of Folk Music, where he is artist-in-residence. Spring Creek UCC is located at 4500 Spring Creek Road in Rockford. A free will donation will be suggested. Pizza and light refreshments will be available for purchase. For more information phone 815 979 1949 or visit www.springcreekucc.org. This entry was posted in live performances, Mark Dvorak, music on July 31, 2017 by admin. (ST. CHARLES, IL) Since 2001 the Steel Beam Theatre has been St. Charles’ home for passionate, engaging, provoking and always entertaining professional theatre. But for an evening each summer, the intimate eighty-seat black box space has been transformed into a folk club featuring Chicago’s “official troubadour” Mark Dvorak. On Friday, August 11 at 7:30pm Dvorak returns to Steel Beam for a special concert, “Let Love Go On,” to benefit the award-winning non-profit organization. St. Charles residents Mike and Phyliss Alberts made the connection four years ago. The Alberts are Steel Beam volunteers and also volunteer at the Old Town School of Folk Music in Chicago where Dvorak has been on faculty for some thirty years. The fourth anniversary benefit concert will feature material from his upcoming CD release, “Let Love Go On” due out later this year. Dvorak who has called folk artist Pete Seeger, “an eternal inspiration,” used the opening lines of Seeger’s 1972 book The Incompleat Folksinger as the roadmap for his latest recording project. Tickets are $20 and can be reserved by phoning 630 587 8521 or visiting online at www.steelbeamtheatre.org. For more information on Mark Dvorak visit www.markdvorak.com. This entry was posted in live performances, Mark Dvorak, music on July 28, 2017 by admin. INDIANAPOLIS IN – Flying Cat Concerts welcomes Chicago’s “official troubadour” Mark Dvorak to the Propylaeum Carriage House, 1410 Delaware Street, on Friday, July 14 The concert begins at 7:30 pm. “At this stage of the game,” said Dvorak, “I feel like I’m doing my best work. I’m hoping to get a new CD out by autumn. I’m very excited about it. I’ve got some new material coming along, and I’m including a bunch of different things I like to do before a live audience. Since 2009, Flying Cat Concerts has presented acoustic music in a variety of venues in the greater Indianapolis area, including concerts in private homes, the Music Room near Butler University and the Carriage House at the Indianapolis Propylaeum. General admission seating is $20 in advance, $25 at the door. Brown Paper Tickets are available at 1 800 838 3006. Online at BrownPaperTickets.com. This entry was posted in live performances, Mark Dvorak, music on June 26, 2017 by admin. CHICAGO IL – Schubas Tavern, 3159 N. Southport welcomes Old Town School of Folk Music artists Campeau and Craig, the Pickin’ Bubs and singer songwriter Mark Dvorak for a benefit performance on Sunday, April 23. The all-ages show begins at 7:00 pm. Each of the artists performs regularly at Schubas’ popular Acoustic Brunch, and the event will support the Old Town School, which is celebrating its 60th anniversary year. “There is a wave of anxiety throughout our community,” said Peggy Browning, who writes songs and sings with the Pickin’ Bubs. “We wanted to create an event that would bring people together during these uncertain political times, and support the inclusive mission of the Old Town School.” Browning also curates the acts at Schubas Acoustic Brunch, and is on faculty at the school. General admission is $12 advance, $15 at the door. Advanced tickets can be purchased at www.lh-st.com Donations to the Old Town School of Folk Music can be made at the event or by visiting www.oldtownschool.org. For more information phone Schubas 773 525 2508. This entry was posted in live performances, Mark Dvorak, music on March 31, 2017 by admin. The first annual Oak Park River Forest Community Sing Along is set to take place on Sunday, April 30 at Doc Ryan’s, 7432 W. Madison, Forest Park. Music begins at 6:00 pm. The event is called “Songs for Peace and Justice” and is sponsored by the Songs for Peace and Justice Fund held at the Oak Park River Forest Community Foundation. Besides the Fund at the Community Foundation, the event will benefit two local community service agencies, the Oak Park River Forest Food Pantry and Housing Forward. “We feel there is hole to fill, and a real need to help nourish our community.” said Stephanie Schrodt of River Forest, who is co-chairing the event along with Betsy Backes and Liz Ziehl. The concert will feature folk musicians Mark Dvorak and Jason McInnes, both from the Old Town School of Folk Music in Chicago. Dvorak, who was named Chicago’s “official troubadour” by WFMT 98.7 FM, will be accompanied by the Power of Song Singers, a ten-member chorus which began at the Old Town School after the passing of Pete Seeger in 2014. McInnes is the director of the Young Stracke All-Stars, an ensemble of youth musicians aged 8 to 14. The group is named for Old Town School founder Win Stracke, who was a singer, early television star and music education pioneer. All ages are welcome to attend. General admission to the event is a sliding suggested donation of $10 – $20. $25 suggested for families. The sponsors regret that the event is not wheelchair accessible. Doors open at 5:00 pm. For information and for sponsorship opportunities phone 312451-5101 or email musicandpotlucks@gmail.com. Visit the website at www.oprfcf.org. This entry was posted in benefit, live performances, Mark Dvorak, music on March 23, 2017 by admin. February 15-18th. Thanks to all who stopped by the trade show booth… artists, presenters, DJs. Great meeting you all! Friday Feb 24th, Brian Ashley Jones was at Uncommon Ground/Devon-Chicago, Saturday Feb 25th brought the music of Tony Bennett at the Mercury Theater. I completed proofreading the new WoodSongs III book for Michael Johnathon, and it had me laughing and crying! Thursday March 2nd was my graduation class performance at the Old Town School of Folk Music… yes, I have been taking guitar lessons, now that I have the new Martin guitar I wanted to try it out. So I started again with Guitar 1 at OTS, it was a small class and we all had it going on, of course my instructor (Mark Dvorak) always has it going on. The class gave me structure and incentive and I am looking forward to the next session. I am sorry that there is not a picture or video of the event. They even had lights and microphones! I now have a deeper respect for those of you who make your life/living on the stage! March 4th was the Annual Paul Seiwert Foundation Benefit for Children with Cancer. David Noll was at Two Way Street Coffee House in Downers Grove, Friday March 10th. Met David at the Folk Alliance Conference Region Midwest where he introduced his new CD Serenade to a Life. Mark Dvorak filled the Acorn Coffeehouse at the Burning Bush Art Gallery in Wheaton, IL this past Saturday. A very nice place for art and music. Michael Johnathon returns to the Hickory Ridge Concert Series in Lewistown, IL this Saturday March 18. There are a couple of wonderful community music events being planned as fund-raisers for non-profit organizations. Stayed tuned for more information! This entry was posted in benefit, live performances, Mark Dvorak, Michael Johnathon, music, WoodSongs on March 13, 2017 by admin. Happy New Year! A new year brings new bookings and promotion. Loretta Sawyer Agency has been working on adding more shows to Michael Johnathon‘s schedule for 2017 and beyond. Mark Dvorak continues to have a full schedule which he balances between traveling to concerts, teaching, and performing for library and senior events. Loretta Sawyer Acoustic Arts provides press releases for his various performances. The Old Town School of Folk Music in Chicago recently recognized Mark Dvorak with the Distinguished Teachers Award. Chris Vallillo is busy with his program O’Freedom! Songs of the Civil Rights Movement which he is performing at libraries and historical museums. The Folk Alliance International Conference is Feb 15-19 in Kansas City, MO. 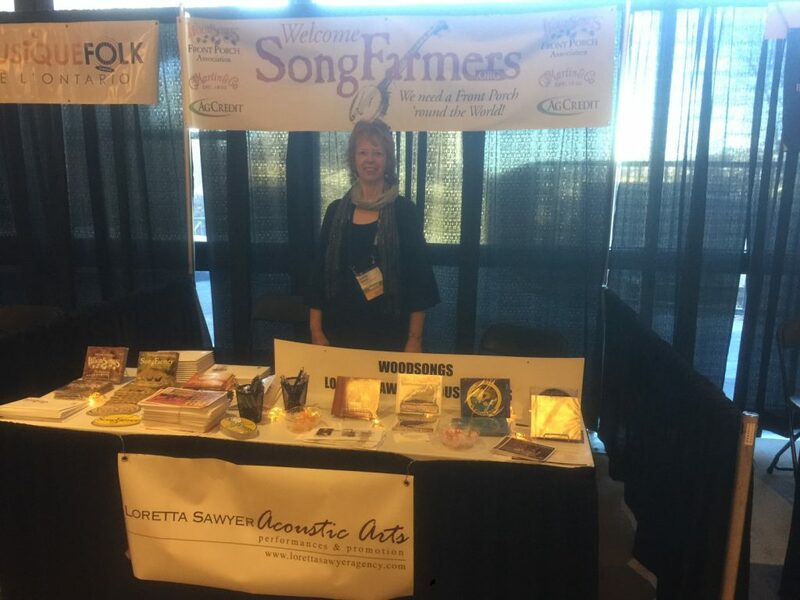 WoodSongs/Loretta Sawyer Acoustic Arts will be having a trade show booth there Feb 16-18 from 11am-3pm. Stop by and visit! Pick up CD samples, information on the WoodSongs Front Porch Association, and become a SongFarmer. WoodSongs Coffeehouses and SongFarmer Clubs are sprouting up all over the country… folks are gathering to play music and sing songs! I have signs on my desk that say PEACE and LOVE… and that is what I wish you! This entry was posted in live performances, Mark Dvorak, Michael Johnathon, music, WoodSongs on January 18, 2017 by admin. Last weekend I was on the road… driving two lane Wisconsin highways with corn fields and farms for scenery, to two special music events…The Shawano Folk Music Festival in Shawano, WI, and then on to The Black Hawk Folk Society concert series in Mt. Morris, WI. Both are wonderful community music events. Thanks to Black Hawk Folk Society for hosting Michael Johnathon; it was truly a special night. Michael Johnathon has released two new CDs… SongFarmer (recorded on an iPhone) and The Dream which will be making its debut to radio for International Day of Peace (Peace Day) on September 21. Loretta Sawyer Acoustic Arts hosted a private showcase room at the SERFA in North Carolina Conference this past May thanks to all the artists who were part of the schedule; especially Brian Ashley Jones and Brad Cole for bringing their fan clubs and filling the room and to Freebo for closing out the room with a special jam. Next conference is FARM (Folk Alliance Region Midwest) in October in Iowa City, IA where the Uncorked showcase will be going for three nights. Looking forward to presenting exceptional talent! Loretta Sawyer Promotions has sent the following CDs to radio, thanks to the DJs for the airplay. On a personal note, my biggest news is that I bought a new guitar… A Martin 000 with a spruce top. Not a high-end model but I never knew a guitar could feel so good. Looking forward to the songs I will bring out of it. This entry was posted in live performances, Mark Dvorak, Michael Johnathon, music, WoodSongs on August 19, 2016 by admin.